The Palestinian Authority (PA) ran a deficit of 10% of GDP in 2014, meaning it is unsustainable. This confirms what we have previously evidenced: the Palestinian Territories are not economically sustainable and are dependent on international donors. The only reason that the deficit was reduced from 25% in 2007 to 10% in 2014 was that this was financed by the international community through financial aid and that the PA is getting indebted to meet their economic obligations. PA’s total public debt amounts to $US 5 billion, which is 39% of GDP. This figure is so remarkably high that if it increased by more than 1% it would be illegal by international standards. 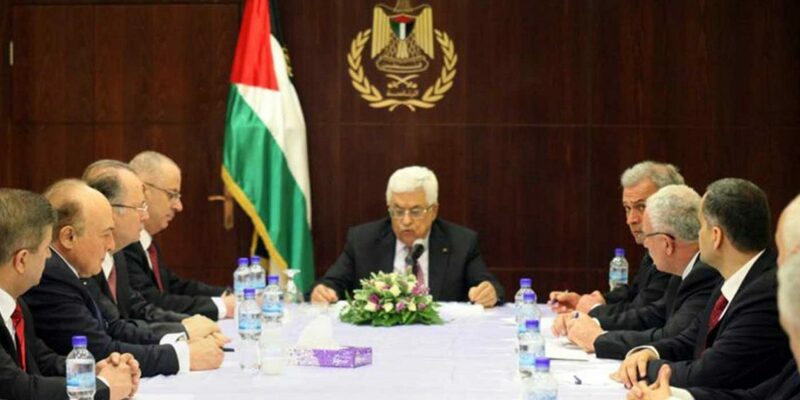 Is the Palestinian Authority indebted for good reasons or is it because they are not managing their resources wisely? The answer is the latter. The main fiscal problem that the PA has is the spending more than it is earning, which is directly linked to the remarkable size of its wage bill and wages paid to people employed by the government. The wage bill represents 17% of GDP, making it the country with the third-largest wage bill as a percentage of GDP just after Denmark and Jordan. For clarification, the Palestinian wage bill is $US 1.9 billion which represents 49.5% of the total expenditure and 83% of its revenues. This means that 83% of the earnings of the Palestinian Authority are exclusively used to pay government employees. Though the public sector employment is only 4.6% of the population, which is considerably lower than the international average of 17%, the problem with the wage bill is the high wage rates that the public employees earn. 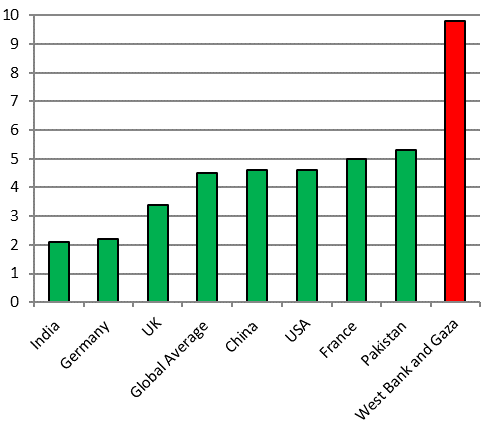 Yearly public wage averaged US$ 11,059 in 2013 which, as a multiple of per capita GDP, is remarkably high. Palestinian public average wage as a multiple of per capita GDP is 3.5., signifying that a public worker on average earns 3.5 times more than the Palestinian national average. This number is even higher than Asia (3), Europe & Central Asia (1.3) and Latin America & the Caribbean (2.5). Further, the public sector wage rate in 2013 averaged 18% higher than the private sector wage rate. Arguably, this is adverse to an economy’s growth because it discourages private investment and entrepreneurship. Also, as mentioned, it increases the bills of the government considerably. Another important issue that is affecting the Palestinian bill is the amount they spend on security. 8% of GDP is paid for security services, where 3% represents the police and prison services and 5% represents the paramilitary forces wage. This means that almost one-third of the wage bill is used only to pay its military force. As a consequence, the Palestinian Authority is able to afford almost 10 soldiers for every 1,000 people, which surpasses the US (about 4.5) and the UK (over 3). This is despite the fact the Palestinian Authority has no land army, air force or navy. Therefore, it becomes clearer that financial aid may be helping the Palestinians to afford the formation of violent groups. The Palestinian pension system is also unsustainable and it is argued that it will become insolvent in 15 years. The pension system represented 3% of the GDP (NIS 1,089) in 2013, even though only 3% of the population is older than 65. Notwithstanding, the beneficiaries only amount to 1% of the population. Notably, half of the beneficiaries are not retirees, but either members of the survivorship programme or disabled. The survivorship programme benefits (i) the widow or widows of a participant; (ii) children and brothers younger than 21 who were dependent on the participant at the time of death; (iii) any children and brothers between the ages of 22 and 25 years old who were dependent on the participant at the time of death and who are continuing their university or higher education; (iv) any children and brothers who were dependent on the participant at the time of death and are incapable of earning a living due to health issues; (v) any daughters and sisters who are unmarried, widowed, or divorced; (vi) parents of the participant; and (vii) husband of the participant if, at the time of her death, he was medically unfit to support himself. The following graphs may provide a clearer perspective. The line in the middle represents the average that governments should spend on pensions in relation to the population over 65 and the percentage of beneficiaries, respectively. Being above the line means a country is spending more than they should and being under the line means that a country is spending less than they should. The Palestinian Authority, being above the line, spends more that the average, which would not be necessarily bad if they were not running deficit and if the number of beneficiaries were larger. Finally, there is further evidence suggesting that the PA is not using resources to help the country grow. Public investment, expenditure on assets by the government, is very low. The PA injected only 5.6% and 5.7% of GDP in 2006 and 2007, respectively, but this figure plummeted to an average of 2% of GDP between 2012 and 2014. In comparison, Sub-Saharan countries’ rates were, on average, 7.6 in 2011 and the OECD countries averaged around 12% percent between 1990 and 2009. Economic theory suggests that this prevents a country from growing. The 2% average is scandalous if one considers that the PA spends 17% of GDP just on the wage bill, 5% on paramilitary services and 3% on the pension system, exhibiting the inability of the government to manage financial resources in an adequate way. People may argue that financial aid is spent on humanitarian assistance, but the fact is that money is fungible. Though financial aid may be directed into good causes, it takes pressure off the Palestinian budget, enabling them to afford other potentially adverse activities. In addition, Palestinians are not motivated to reform their systems because the international community will bail them out if they cannot meet their economic obligations. Perhaps with greater foreign aid restriction, they would be pressured to find a way to use their resources more wisely by decreasing unnecessary paramilitary services, cutting down their generous pension systems and investing in a profitable way. Unfortunately, as our previous study explained, the international community is showing little willingness to hold the Palestinians to the standards to which they hold other countries. It is important to point out that this article does not look into the Palestinian Martyrs Fund, which is used by the Palestinian Authority to pay terrorists who carry out attacks on Israeli civilians. The martyrs fund is around 2.5% of GDP. This will be included in a separate article.